One of my favourite sayings was purportedly coined by one of the greatest exponents of his craft the world has ever seen – Albert Einstein. “The definition of insanity is doing the same thing over and over again and expecting different results”. Whether the 17th-century physicist actually said it or not is by the by. It holds sways and epitomises the current state of affairs at Manchester United. Is there a worse run club in the Premier League than United? My local non-league club are in better boardroom shape than the shambolic mess presided over by the G*****s and their penny-pinching puppet Ed Woodward. I’m giving Woodward no credit for the Ole Gunnar Solskjaer appointment. Even he couldn’t mess that one up. We’ve no doubt finally got the right man in the dugout, but his hands are tied by the nonsensical decisions of those above him. All the time that Manchester United are run by this regime, we’ll only be challenging for fourth and fifth at best. Wolves exploited the Reds weaknesses again and exposed the ham-fisted raison d’etre of the Old Trafford hierarchy in damningly brutal fashion. It’s 2019, yet here we are, STILL, with Ashley Young, Chris Smalling and Phil Jones donning the red of United and lining up in defence. The excrement trio. The Three Stooges. The Chuckle Brothers. The same players making the same mistakes week after week, season in season out. How these three players, along with one or two others, are still playing at Premier League level – never mind for our club – is baffling and simply beggars belief. Jones and Smalling have never been up to standard, and Young was a half-decent squad player as a winger upon signing in 2011. But modern football waits for no man and Young simply cannot keep starting as United’s regular right-back. He should have been jettisoned as soon as he made the transition from winger to a defender. Yet all three have recently penned inexplicable new deals whilst United’s pawnbrokers are happy to let Ander Herrera, David de Gea, Juan Mata and possibly Paul Pogba leave for nothing. Giving not-good-enough players ludicrously lucrative deals but running down the sands of time on those who should be indispensable. Such hubris. Herrera is one of the few genuine leaders in the dressing room, a bundle of energy, passion and fire. He may not be worth the 200k-a-week he’s supposedly demanding but Alexis Sanchez is to blame for that. To let him go on a free is criminal. 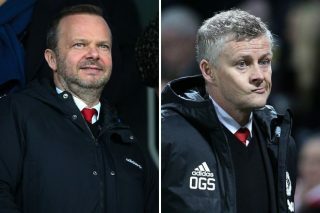 Instead of just coughing up and paying the extra few hundred, United will now spend the whole summer treading water in search of a replacement instead of failing to jettison players that have been stealing a living at this club for far too long. There’s more deadwood in the United dressing room than at the original viagra trials. As for De Gea and Pogba, there is no doubt that current uncertainty is affecting both form and morale. De Gea’s head has not seemed right for several weeks now and the keeper was at fault for both of Wolves goal amid the carnage of the Molineux deja vu. I get that there does indeed have to be an element of business decision-making in what goes on in the corridors of power, but we are, first and foremost, a football club. Solskjaer is a good man, he has done well, and he could yet prove to be a genius with a full season under his belt and with a transfer window to invest in but only the future can tell us that and the future wasn’t under any threat. But given the chain of events in the current corridors of power, can we really be confident that Ole will be handed the tools to undergo the financial overhaul that he so desperately needs and deserves? But, in all their wisdom, the United board put their eggs in a basket that they are yet to feel the depth of yet, and they only did it to please the fans – who will turn anyway if results don’t. Could Ole be fighting a losing battle with this board?